Why Take a Face Yoga Class? Why take a Face Yoga Workshop in person instead of instead of just googling facial muscles at home? The difference is like taking a yoga class at a studio versus popping in a DVD to do in your living room. Yoga instructors are there to help you with corrections so you can get the most benefit from the poses. It's the same with Face Yoga! With over 40 muscles in the face, it's important to know you are working the correct muscles or you can potentially add more wrinkles and lines!! You don't want that! So let me show you how to correctly tone your face and help smooth out those unwanted wrinkles and lines with Face Yoga. Email me if you are interested in attending one of my workshops or have a private 1-on-1 session. When you concentrate really hard, are you creating 11 lines? You know the lines between your eyebrows? Or, do you even know? Next time you work on a project that involves focused concentration, have a mirror handy and see if you indeed are creating 11 lines. Look how tense, unapproachable and the major 11 lines going on in the left photo! I'm more relaxed, approachable and no 11 lines! So pay attention to expressions that are adding unwanted lines to your beautiful face! Face Yoga Workshops are in full swing! Here is another group of lovely ladies that have taken my Face Yoga workshop, aren't they beautiful? A FREE workshop for people who want to know what Face Yoga and Doterra Essential oils are all about and how they can be used to take care of your skin naturally. Click here to register. This is an in-depth Face Yoga workshop focusing on exercises, mindfulness, and healthy lifestyle habits for healthier skin. Click here to register. #1 - I have been hired by the Face Yoga Method team to assist in the next teacher certification course! I'll basically be helping students along their journey of becoming certified Face Yoga instructors like me. #2- I had my first Face Yoga Workshop 1 this weekend with these beautiful ladies and we had such a great time together! I look forward to teaching a lot more of these! Click here if you would like to see the dates of the next Face Yoga Workshop 1. #3- I am now certified as an Essential Oil Coach through the Essential Oil Institute founded by Dr. Josh Axe. I am so excited about creating natural skincare products from these powerful oils! I have created an all natural, organic anti-aging serum that I'll be blogging about next time. So, I'm feeling very grateful for the amazing things happening in my life right now. I hope this blog post finds you in a wonderful place too! You can always unsubscribe at anytime. I'm proud to announce my first free ebook is now available! Now I can check that off of the many things I'm learning to do as an entrepreneur in this social media age! More importantly, I'm very excited to share with you easy ways to incorporate healthy habits that will help you looking your best, naturally. Click on the link below to get your free copy. Learn even more at my Face Yoga Workshops and 1-on-1 sessions. Have any questions for me? Please let me know! Why Take A Face Yoga Workshop? There is a lot of great information to share about Face Yoga on how to encourage more healthier and younger looking skin. Especially with the facial exercises, there are over 70 of them to target certain muscles in the face! It's similar to going to a yoga class. The instructor is there to assist you in your poses. The slightest correction can make all the difference in the benefits from doing the pose. The same with Face Yoga. You want to learn how to do the poses correctly to get the most benefit. The group setting is wonderful because it's great to meet other people interested in natural skin care like yourself! A Face Care Workshop is also a great act of self-care for yourself! The benefits not only will improve your complexion, they will improve your overall health! 1st Face Yoga Workshop will be Saturday, June 17th 9:30 to 11:00 at University Hills Library! Let's take a Face Yoga quiz! It's pretty amazing to think that our face alone has 43 muscles. It makes sense to have so many in order to create our many expressions! If we don't exercise our body, our muscles lose tonality. Same with our faces because of all those muscles we have up there! If we create an expression often, like frowning for instance, we will start to create unwanted lines. For example, take a look at my photo to the left where I'm concentrating/frowning. Look at the lines it creates on my forehead! Now, imagine holding that expression for much of the day. No wonder lines are created that way! That is where Face Yoga comes in. You will learn how to tone your face for a firmer complexion, how to become more mindful of the expressions that are causing those aging lines and learn healthy lifestyle tips that will greatly benefit your skin from the inside out. By attending my workshops or 1-on-1 sessions, you will learn how to incorporate Face Yoga so you can age gracefully and naturally. Let's start working those face muscles! Sound good? The beauty industry wants us to buy expensive beauty creams and invasive procedures. What if I told you there is a safer, cheaper, and natural alternative? That is the answer to why do Face Yoga! Incorporating exercises to tone the facial muscles, becoming mindful of expressions that create wrinkles, and learning about healthy habits for our complexion is what Face Yoga is all about, a natural skincare program! Join me in my workshops to learn more about this exciting approach to aging gracefully and naturally. There is so much wonderful information I want to share, you might want to consider getting the "Best Package Ever" which includes two Face Yoga workshops you attend and a 1-on-1 Skype(or FaceTime) session. This way, you learn many of the Face Yoga poses to tone facial muscles and learn how to incorporate many healthy lifestyle tips that will improve your skin from the inside out! By attending the two workshops and one 1-on-1 session, you will learn how to incorporate Face Yoga as a practice into your skincare regime. Click on the "Best Package Ever" image for more information. If you have any questions whatsoever, give me a shout! I'd love to hear from you! I passed my final assessment by doing a Skype session with the founder, Fumiko Takastu today. I was nervous to sell myself to the woman who created this great skin program! Luckily, Fumiko was very encouraging and taught me well and this final step went just fine. I am honored to be one of the first students to become certified outside of Japan. This green light means GO! I'll be putting the pedal to the metal because I am ready! So, buckle up and enjoy this adventure with me! Tomorrow, I'll provide more information on my Face Yoga workshops, 1-on-1 sessions and dates available. Thank you everyone! I'm excited!!!! If you haven't already signed up to receive news and updates, please add your information here. Thank you! Many people look into the mirror and suddenly are surprised at what they see. " Wow, I look older than I feel. What happened?!" Well, that was me last year. So, I started to do some research on how I could solve this problem. I certainly wasn't going to have Botox or plastic surgery done. So what were my natural options? That is when I came across Face Yoga. It totally made sense to exercise your face muscles like you would the rest of your body. The first video I found was this one with the beautiful Rhanjana Khan. I loved the 7-8 exercises she shares, but I wanted more! That's when I came across Fumiko Takatsu's website, FaceYogaMethod.com. It is jam-packed with information about her Face Yoga Method she developed! What really intrigued me was the fact I believed a lot in what she was saying. For instance, Fumiko really believes in treating your skin well by not only doing Face Yoga, but also eating healthy and also implementing mindfulness into your life. YES, that all maked total sense to me! What a total new concept of skincare: a holistic approach from the inside out! Look how much my complexion is more even toned after just 3 months! I sound like a commercial right? But it's true! I have less dark circles under my eyes, my eyes look brighter and the areas next to my nose is less meaty. I think I look younger. More importantly, I look more alive, more confident and more happier. BTW, I only have eyeliner and mascara on in both photos. So, here I am about to become an official Face Yoga teacher very, very soon! Not to worry, I will continue my love of painting. In my next blogpost, I'll talk about the "WHY" of doing Face Yoga. Hint: there are so many benefits I want to share with you! If you have someone who would be interested in Face Yoga, could you please share my website with them? Just click on the share button down below. I'd really appreciate it, thank you. As always, let me know if you have any questions or comments. If you haven't already done so, please sign up with your email address to receive news and updates. Not to worry, you can always unsubscribe at any time. Bringing Face Yoga To Denver And Beyond! Most of you know that I have been taking a course to become a certified Face Yoga instructor these past months. So, what is Face Yoga and what does it mean to be a certified Face Yoga instructor? 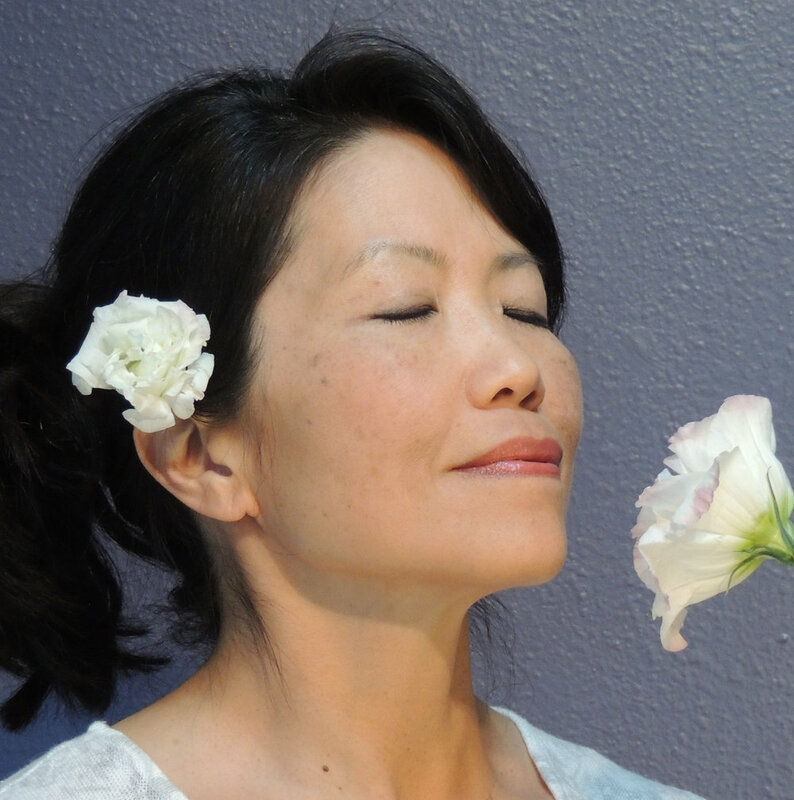 Specifically, the Face Yoga Method was developed by Fumiko Takastu of Japan over ten years ago! Her approach to natural skin care that includes exercises to tone face muscles, awareness of expressions that cause wrinkles and lines on our face and practical lifestyle habits that encourages transforming your beauty from the inside out. What does it mean to be a certified Face Yoga Instructor? In Japan, Fumiko certified over 400 people to teach her Face Yoga Method. This is the first time she is offering certification outside of Japan! You would think a bunch of people from the States would jump at the chance since Face Yoga is a new “thing”. However, most of my fellow students are from around the world like England, Vietnam and Mongolia even! Isn’t THAT cool? In the meantime, I’m waiting for the last step of our certification process-a one on one skype interview with Fumiko. I'm hoping for it to happen in the next week or so. I am so ready to teach all of you Face Yoga! This natural approach to face care is something I really believe in. I want to empower people with this fantastic way to take care of your skin and also take care of your SELF mentally and physically. It’s a beautiful way to age gracefully and naturally. If you know anyone who might be interested in Face Yoga, please share my website with them. Stay tuned for my next blog post. I’ll talk about how I got into Face Yoga! Until then, check out my website and see the June workshops I have scheduled HERE. Thank you everyone!